This weekend I went on a little getaway with my best girlfriends from college. We all haven’t been together in 5 years! Seven of us flew from all over the country to the ranch where my friend Jessica grew up, just outside of Yosemite National Park. The weekend was full of catching up, laughing until we cried, and eating lots of good food. It was so great to see my best friends! Girls weekends are just good for the soul. The whole trip friends were so great about eating gluten-free meals and having gluten-free snacks with me. One of my favorite treats we ate by the pool one day was a bag of Gluten-Free Crispy Chocolate Chip Cookies from Trader Joe’s. I was reminded how much I love a good, buttery gluten-free cookie! I was also reminded how much I miss Trader Joe’s! We are moving to San Diego at the end of August and I can’t wait to live by Trader Joe’s again. It really is one of my happy places. 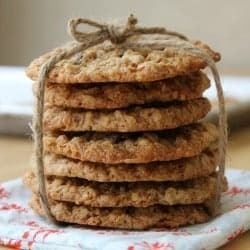 These oatmeal scothchies also fit the ticket for a good, buttery gluten-free cookie! They are just as great as the cookies I remember from growing up. Toasty oats with sweet butterscotch chips in a soft, yet crispy cookie really make an amazing combination. You would never know these cookies are gluten-free! I love bringing treats like this to parties or get togethers and never mentioning a word about them being gluten-free, unless people ask. In the words of Julia Child “Never Apologize!” My version of this is “never apologize for gluten-free baked goods!” Enjoy! 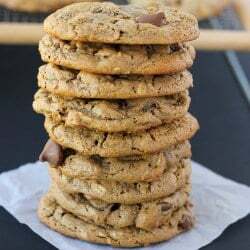 Toasty oats with sweet butterscotch chips in a soft, yet crispy cookie make an amazing combination. An old favorite made gluten-free! 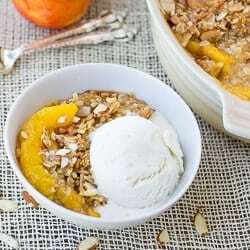 In a medium bowl, combine all the dry ingredients except the oats and butterscotch chips. Using a mixer, cream together the sugars, butter, and shortening. Add the egg, vanilla, and water and blend until smooth. Add the dry ingredients and blend until combine. Stir in the oats and butterscotch chips. Scoop rounded balls of dough onto the cookie sheet about 3 inches apart. Flatten slightly. Bake for 9-11 minutes, until lightly golden. Cool slightly – enjoy! This dough can be formed into balls and frozen. To bake cookies the directly from the freezer and just add 2 minutes onto the cook time. Can I use something other than xanthan gum? I don’t have any. I was wondering if something in my pantry would stand in for it? Hi Mel! You can use 2 tablespoons of whole psyllium husk. Or you can try adding 2 tablespoons of ground flax. Both of those ingredients have binding properties. Or you can just omit the xanthan gum. The cookies will be a bit crumbly if you do, but will still taste delicious! Just made these without the xanthun gum. Used all purpose gf flour. Came out fine. any idea if I can sub in oat flour for the ap flour so they are gluten free? These are awesome!!! First time I’ve used xantham gum and Betty Crocker GF flour and these cookies turned out perfect! Looking forward to taking them to family Christmas dinner where we have several gf and celiac family members. Great recipe…thanks!!! I made these tonight and they were a huge hit with the family. I substituted xylitol for the white sugar and they couldn’t even tell. Thanks for sharing this awesome recipe. Good to know the cookies work with xylitol! I’m glad you liked them! What brand of butterscotch chips did you use? The Nestle brand is not gluten free (their chocolate and peanut butter chips are however). Hershey’s butterscotch chips are gluten-free! Thanks for the heads up about Nestle. This was a great recipe which I tweaked slightly due to not wanting to buy some of the extra costly ingredients I didn’t have on hand and also bexause I can NEVER leave a recipe AS IS (I’ve always got to make it “my own”…lol.) In place of the butter I substitute in 1/4 cup regular cream cheese (slightly softened), 1 tsp of solidified coconut oil instead of the shortening (much healthier alternative in MHO) and 1 tsp ground flax seed instead of xantham gum (which I blended with the cream cheese, coconut oil and sugars instead of the other dry ingredients) My reasoning being that I felt it would be more evenly distributed and incorporated with the dry mix once it was added. They turned out soo AMAZINGLY chewy with just the right amount of crispy firmness ariund the edges to hold the cookie together. Had to cut hubby off and hide the rest….lol. Finally a GF cookie that tastes like the real deal but doesn’t leave me reeling with stomach cramps and leg pains….Hooray! Thank you so much!